With the OnePlus 5T now officially out of stock -- and not being replenished -- in the US, coupled with the time of year, it should come as little surprise that there's a new OnePlus handset around the corner. Yep, the OnePlus 6 definitely has a notch -- deal with it! While the existence of a notch is not confirmed by this image, it does show that the headphone jack is still present -- something that will please fans of wired headphones. The image may be our first look at the handset, but there's little we can discern from it. 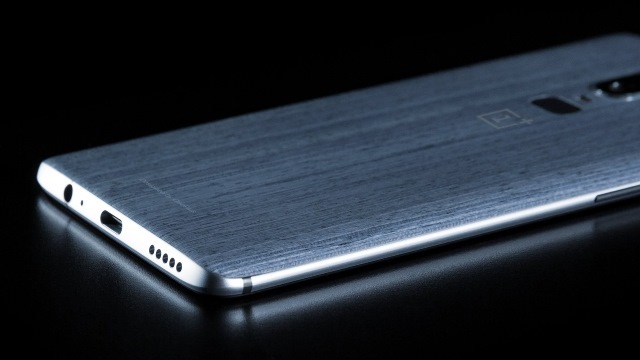 The photo shows that the rear of the OnePlus 6 is textured, but the fact that it is a black and white shot makes it hard to tell whether it is metal textured to look like wood, or if it is actually wooden. We can also see dual cameras and a fingerprint reader. Still, as we approach Q2, it shouldn't be long until we know more for sure.